The tagline for SDI Technologies/iHome iHM77RC is “Sound Beyond Size”. I got a chance to try out these Portable Multimedia Speakers when I got home from CES 2009, and I have to say that “hearing is believing” for iHome’s surprisingly truthful slogan. I plugged in these speakers to my laptop, and I was surprised that I had to turn down the volume on my computer. Normally, when I plug in speakers that are this small (two inches in diameter), I have to crank up the volume dial all the way just to hear anything. The iHM77RC have a li-ion battery that is recharged by USB, and they can be used continually if left in the laptop’s USB port. As you can see from the picture, they are collapsible, but what you can’t see is that the bases are magnetic. The speakers are designed to magnetically link together, which makes them easily portable with the included carrying case. 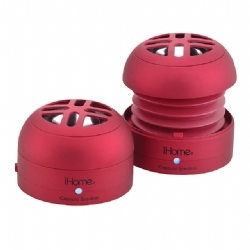 You should be able to purchase the iHM77RC at the iHome site for about $50. I say “should” because, at this writing, they will be “in stock soon”. I’m sure that they will be ready to ship by the time this entry gets old. These Portable Media Speakers come in both red and black. For more information about the iHM77RC, click here.